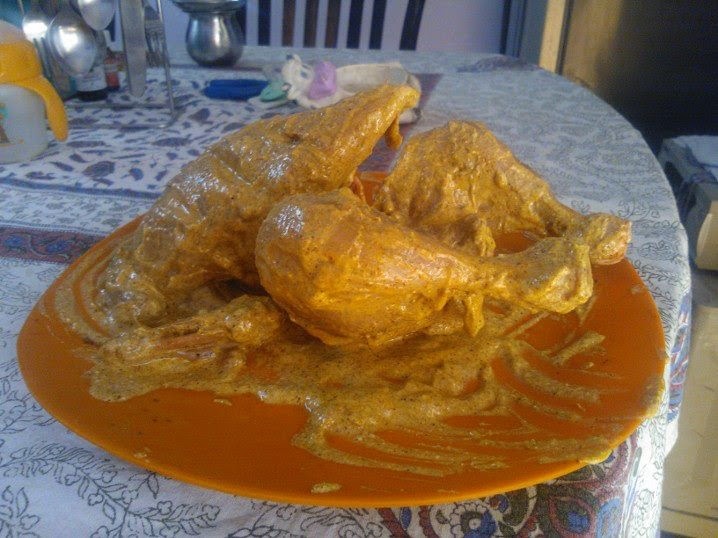 Now how do you get that juicy Tandoori/Grilled/Roasted Chicken. I will tell you! Its very important to make cuts in the chicken at the right places for the marinade to go deep inside the flesh and to the bones! If you don't do it, it will come out dry and i am sure you won't like it! Make cuts with a sharp knife on breast, drum sticks, thighs! Once you do this, move to the marinade. Sprinkle salt, red chilli powder, garam masala, lemon juice and ginger garlic paste on chicken. Now this is where you get your hands dirty and rub the chicken inside out, even in the cuts. Now it really reminds of the song by John Mayer (Your Body is Wonderland, I will use my hands). Well let me tell you, you have to love your chicken for it to be delicious to you! Now let it marinate for 30 minutes for the masalas to gel with the flesh. Take hung yogurt, add salt, red chilli powder, garam masala, black pepper powder, ginger garlic paste and mustard oil and mix well. It should come out smooth and a nice texture with good consistency! Remember, you have already added few of the spices in 1st marinade so be careful of the quantity! Now, its very important to know that Tandoori Chicken is never grilled, its roasted! Like its done in Clay Oven (Tandoor). So, you will only use the Convection option in your Microwave Oven unit!Now if you know how its cooked in Tandoor, it will help you cook exactly the same way in your household microwave. So, first, preheat the oven. If you have Fast preheat option your microwave, use it. It will take about 15-20 minutes to preheat! This step is very important as if you know, in restaurants they put chicken in Tandoor only when its nice and hot! Once it's pre-heated, take the crust plate (the black plate you get with microwaves) and grease it will oil! This will ensure it even cooks from down below and doesn't stick! Place the chicken on crust plate and put it inside. Use the convection at 220 degree C for 30-40 minutes. 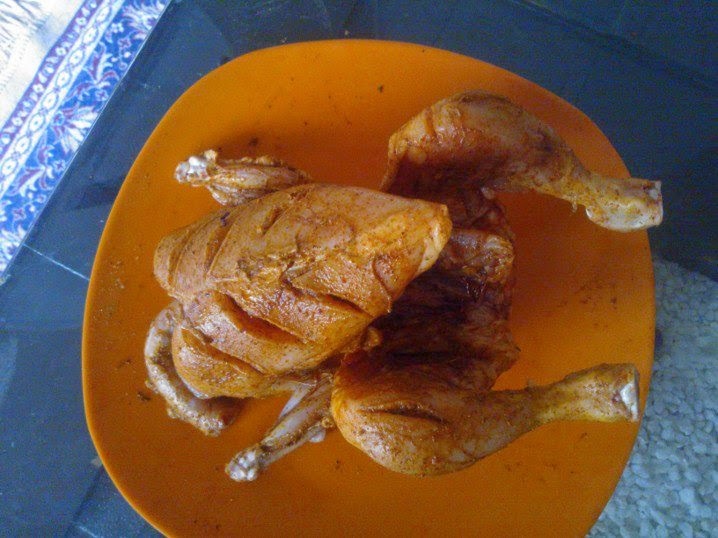 Now its the size of chicken which determines the cooking time. If you are taking a smaller chicken or bigger one (I have taken 800 gms chicken), decrease of increase the cooking time! Keep checking the chicken, when it start getting brown, baste it with butter all over and again let it cook for remainder of the time. Turn it over in between to ensure uniform cooking! Hope you try it, enjoy it and impress people you want to impress by presenting it will onion rings, coriander leaves and sliced lemon. And yeah, never forget the green chutney! Also, look at this Pot Roast Chicken recipe which is totally different and amazingly delicious. Do leave your comments below and subscribe to my blog via email to keep getting wonderful recipes.